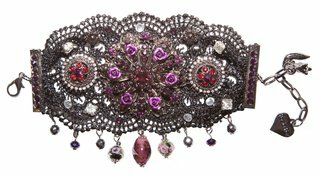 Stunning black lace cuff with a choice of either pewter or amethyst vintage style detailing. Embellished with crystals and faceted iridescent glass beads. Adjustable. Tear beads and finished off with fox and heart charms.